With today's release of the latest Q4/14 GDP estimate, we learn that corporate profits—despite the damage suffered by energy-related companies from the plunge in oil prices in the second half of last year—were still quite impressive: $1.84 trillion after tax on an quarterly annualized basis, and about $1.83 trillion the year as a whole. That puts profits very close to all-time record highs, both in nominal terms and relative to GDP. 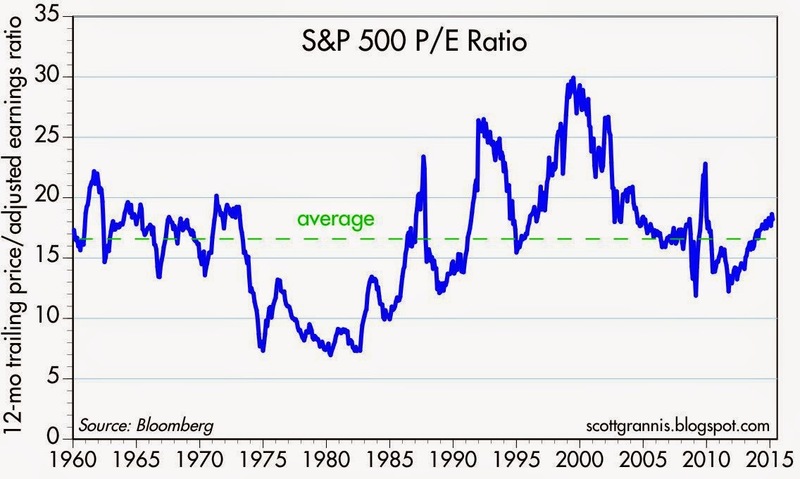 Yet standard PE ratios are only modestly above their 55-yr historical average. This anomaly—record-setting profits vs. only slightly above average multiples—has persisted for years, and it calls into question the oft-repeated claims of those who argue that stocks are in "bubble territory." To fully understand this argument, I recommend reading a series of many similar posts over the past 5-6 years. I'm using the same charts over and over, and making the same basic argument, which is that corporate profits have been extraordinarily strong for years, but the market has been (and is still) unwilling to assign an unusually high multiple to those profits. This tells me that equities could be fairly valued at current levels, and at the very least they do not appear to be "overvalued." 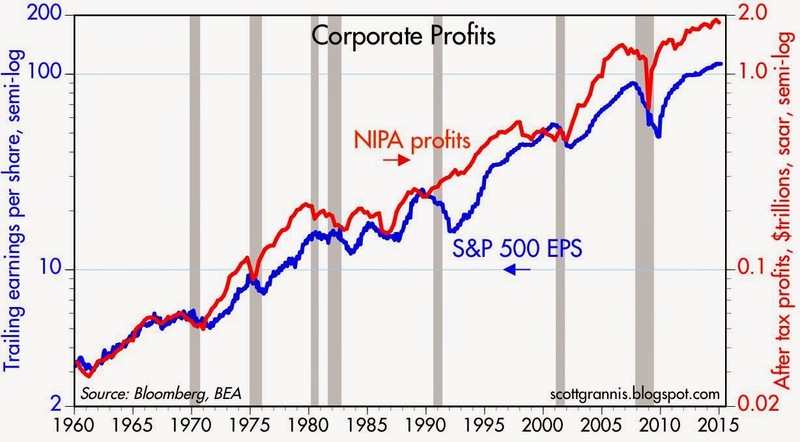 The chart above compares after-tax corporate profits as reported by S&P 500 companies using GAAP standards (blue line) to total after-tax corporate profits of all companies as measured by the folks at the BEA (red line). Note that the scale of each y-axis is similar (the top value is 100 times the bottom value), and note also the apparent divergence of the two lines beginning in the early 1990s. I explain here some reasons for this divergence (e.g., different tax regimes and different accounting standards have combined to understate corporate profits when calculated by GAAP methods). 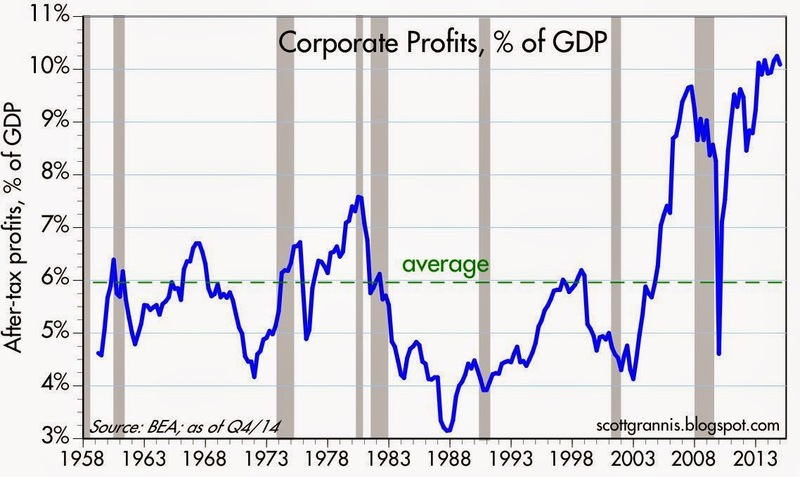 Regardless of the divergence, corporate profits by either measure are at or near record levels. When compared to GDP, after-tax corporate profits are doing extraordinarily well from a long-term historical perspective—far above their long-term average. It's almost never been such a good time to own equities. 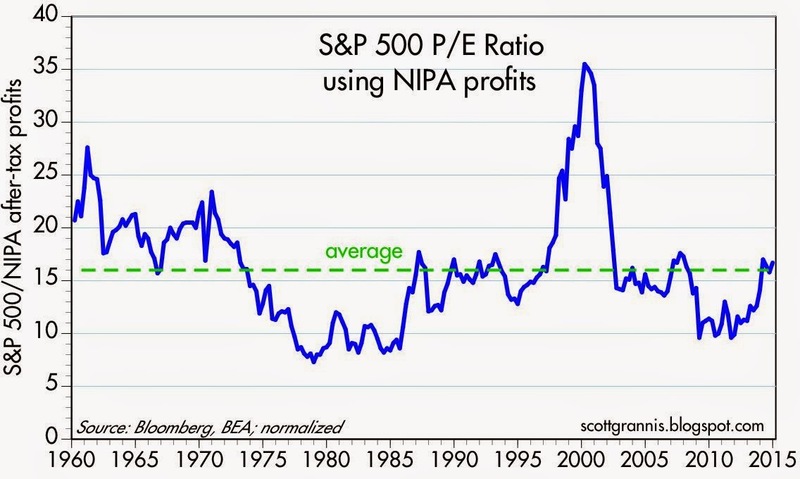 The chart above uses the NIPA measure of after-tax corporate profits as a proxy for earnings of the S&P 500, constructing a measure of price/earnings by dividing the S&P 500 index by NIPA profits and normalizing the series so it has the same long-term average as the commonly-used measure of PE ratios. If the NIPA measure profits is closer to the true underlying realities of corporate profits, then PE ratios today are simply average, and orders of magnitude less than they were at the height of the dot-com "bubble" of 2000. This last chart is the standard measure of PE ratios, for context. According to this, PE ratios are only modestly higher than their long-term average (18.3 today vs. an average of about 16). But think once again what this means: despite the fact that corporate profits have reached exceptionally high levels for several years running, PE ratios are only average or slightly above average. This is not at all what you would expect to see if the market were overly enthusiastic about the future. No, this is a market that is still very skeptical of the ability of corporate profits to sustain current levels, much less continue to grow. In fact it could be symptomatic of a market that is actually priced to a decline in profits from current levels. The market is setting the bar relatively low. Equities are no longer a steal, but neither are they even close to being egregiously overvalued. I've argued for more than a year that profits growth would be likely to slow, and that further progress for the stock market would be driven mainly by an expansion of multiples, and that is a pretty good description of what the reality has been. I look for more of the same: slower profits growth, maybe even flat-lining, but higher multiples. Today's PE ratio translates into an earnings yield of about 5.5%, and that is still very generous given the prevailing level of Treasury yields. 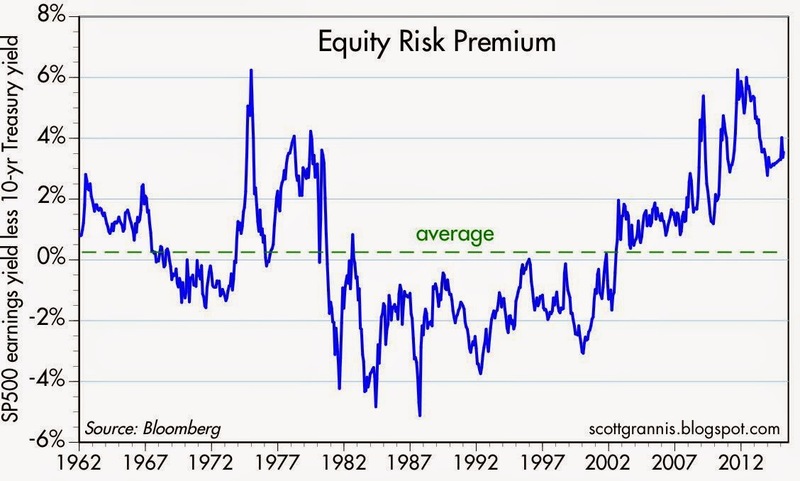 As the chart below demonstrates, equity risk premiums are still unusually high (currently 3.5%) when viewed from an historical perspective. This is still a market ruled more by caution than by enthusiasm. Economy in U.S. Expanded at 2.2% annualized rate in Fourth Quarter. For all of 2014, the U.S. economy grew 2.4 percent from 2013. For all of 2014, Consumer spending rose 2.5 percent. For all of 2014, corporate profits were down 0.8 percent, the first decrease since 2008. William: there are several different measures of corporate profits contained in the GDP stats: before tax, after tax, quarterly annualized, annual, and adjusted and non-adjusted for capital consumption allowances and inventory valuations. They are all a bit different, but they all tell the same story, in my view: corporate profits are very close to all-time highs in both nominal terms and relative to GDP. These numbers can be selected and manipulated to show that profits rose or fell last year, depending on your preferred outcome. But there is nothing in the numbers as I see them which points strongly one way or another. Excellent blogging. I think US stocks are fairly priced. Investors are to be admired; lots of risks out there. U.S. entanglement in another war? Higher taxes? A strong dollar does cut reported earnings. Recessions are always a surprise. Did the Fed cut QE too soon? Maybe--that was the track record in Japan. We could see lower interest rates yet. India and Japan look interesting. Hard to find bargains anywhere---the world is flush with capital yet aggregate demand is weak. another point to consider is that due to buybacks there is considerably less stock float than would be otherwise available. couple that with an incredible amount of $ still looking for a "noncash" home, and demand for stock is not likely to wane soon. hard to see anything but garden variety "correction" in the near future. Thank you for your views. My feeling is also that US stock prices are not much overvalued, though it is just that--a feeling. So, are we to view indicators such as SP500 to regression trend, Total Market Cap to GNP, Household percentage of financial assets allocated to equities, Median P/E Multiple, and Median Price to cash flow as mostly just long-leading, or even very long-leading? Thank you Scott for your explanation. I am just itching to find a contrarian view. To what extent are Corp profit margins dependent on swapping long term debt into libor/short term hedges? A rate hike will wipe those profits out. Explains the no multiple expansion.